Having a photo booth at your event will provide excellent entertainment for you and your guests. Priceless memories will be made as everyone from grandparents to children strike a pose in silly hats, mustaches, and glasses. You and your guests will let loose, have fun, and will appreciate the instantly printed photos for years to come. 1. Pick a prop. Choose something that will disguise you or something that highlights your style! 2. Step into the booth. Sit down or stand up, squeeze in or stretch out. Open the curtain or keep it closed. 3. Tap the screen, strike a pose, say cheese! 4. Pick up your prints. Keep both, split them, or add a copy to the scrapbook. 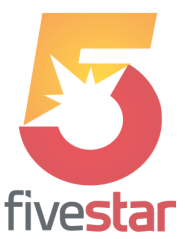 Why Five Star Photo booth? Our photo booth is sleek, modern, and elegant. We use a high quality DSLR camera, a multi touch display, and an advanced dye sub color photo printer to capture and print candid moments for you and your guests. We coordinate with you to customize the color, text, and design of the background your photos will print on. Our prop selection is constantly evolving and growing. It includes hats, glasses, mustaches, wigs, boas, scarves, helmets, and goggles among countless other things! We offer the option to have a copy of the photos taken throughout the night arranged into a scrapbook that will be ready to take home at the end of your event along with a digital copy on USB memory. We also believe in privacy, we never publish or re-print the photos you or your guests take without permission. What about a professional photographer? A photo booth cannot replace a professional photographer. We offer a quick, interactive, and fun way to capture images on your special day. We recommend combining a professional photographer with our photo booth services for the best experience. If you need to cancel for any reason including weather, illness, injury or any other unforeseeable event your deposit will be kept, all other agreed upon services will be charged for. We will work with you to transfer services to another day if we are available. Our services are focused on South Eastern New Mexico. This includes Roswell, Artesia, Carlsbad, Ruidoso, Alamogordo, Hobbs, Clovis, Portales and all the areas between. We will travel to any location for any event outside of the areas listed for a travel fee, contact us.